Google has unveiled the Moto X, the first phone it has designed from scratch since acquiring Motorola Mobility, as it seeks to best Apple's iPhone with a mobile made in the USA. Teaser advertising for the Moto X trailed a "Designed by you. Assembled in the USA" message, which echoes its rival’s "Designed by Apple in California " marketing campaign. Motorola claims there is "no touching necessary" when using the Moto X, because the voice-activated Touchless Control feature allows users to "check the weather, get directions, or do just about anything without lifting a finger". The Touchless Control will put the Moto X in direct competition with the iPhone 5, which uses Apple’s voice-activated "intelligent personal assistant", Siri. However, Motorola claims "Moto X doesn’t guess like other phones do, it knows". A 'Moto Maker' online studio will allow people to personalise the phone when purchasing it, with customers being offered the chance to design it themselves by picking a colour and adding a name or short message to the phone. The Moto X will then be assembled in a Motorola factory in Fort Worth, Texas, and shipped to the customer in "four days or less". 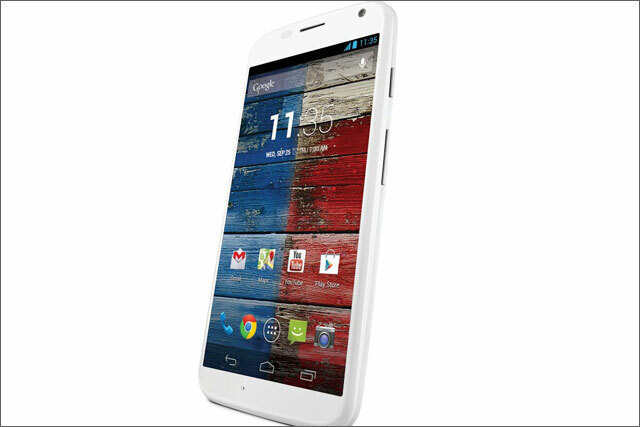 Moto X will be made available in the US, Canada and Latin America in late August or early September. Motorola has yet to announce any European launch dates. Google hopes its Moto X will give it the edge as the battle between its Android operating system and Apple’s iOS rival system continues to rage. Forrester analyst Thomas Husson claims more than one billion individuals now own a smartphone, with adoption expected to expand to three billion devices by 2017. Other findings released in today’s Forrester report reveals iPhone owners are more likely to use mobile services regularly. Some 46% of European iPhone owners surveyed claiming they research products for purchase at least weekly, compared to 29% of Android users.